The Creative Crypto Now "Marble-able" on MarbleCards! We’re thrilled to announce that content on The Creative Crypto is available to be marbled on Marble.Cards! We’ll be the first media outlet and creative forum to be supported by the platform and anyone can now choose their favorite pieces of content and create immutable collectibles to sell and trade. Marble.Cards is a new application built on the Ethereum blockchain that allows you to “marble” individual online URLs and turn them into digital assets. These cards can be created, sold, collected, and used in a myriad of ways by both the original publisher of the online content as well as the holder of the cards. So far, the platform has set up the ability to marble a few key internet databases including WikiArt and Know Your Meme. The public has taken full advantage of this offering, marbling over ten thousand unique collectibles from only a handful of the sites supported thus far. As a magazine, this opens up many new possibilities on the blockchain to reward our readers and host creative activities. We’ll be able to issues non-fungible artworks and bonus content to card holders through airdrops, for example, or issue special-edition card prizes to people with “the perfect hand.” Overall, this partnership offers more ways to interact with and appreciate the work coming out of a blockchain-integrated magazine and perfectly aligns with our mission to ‘walk the walk’ when it comes to crypto creativity. And to kick things off, we have a special contest announcement [right here]! You'll be in the running for the one and only Creative Crypto Origin Card so be sure to participate from now until March 11. So be sure to explore through our current and older content to snag your favorites for Marble.Cards! We have hundreds of unique articles and billboard updates since last year to dig through and we’re looking forward to your selections. 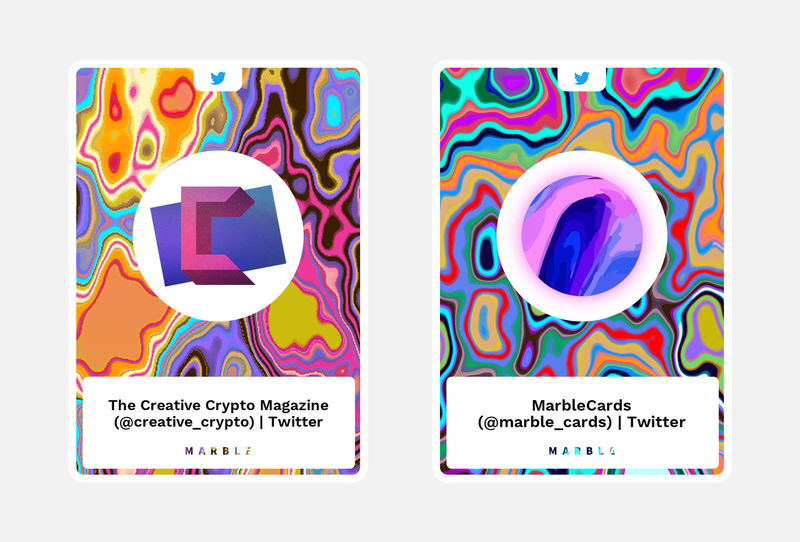 Be sure to share your new cards with us by tagging @creative_crypto in your tweets and follow announcements on @marble_cards for more chances to earn rare collectibles.